During the harvest campaign of 2016, Permastone has made its entrance into some of the most prestigious Italian wineries to treat flotation and clarification lees. 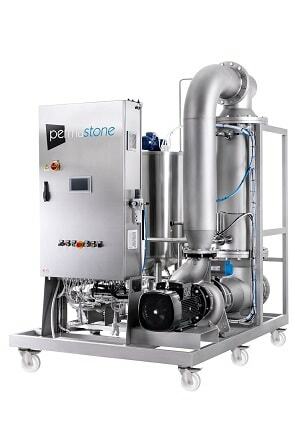 Permastone is Permeare’s latest and innovative tangential filtration system; it can treat lees and recover wine and must without compromising their quality, representing a valuable replacement for vacuum filter. Permastone treat wine lees with great results: the final product can compare to clarified wine, and the recovered product turns out to have a much higher value than the equivalent products obtained with a rotary vacuum filter.Permastone also works with flotation lees, extracting a product that is very close to free-run juice. Mineral membranes allow Permastone to reach a high productivity with a low frequency of washing, which also comes with an optimal recovery of performance during the cleaning cycles. Compared to the membranes chosen by the competition, Permastone ones are more resistant and can assure higher yields. There is no question Permastone is an excellent investment for recovering wine from lees: the result is a superior product with unaltered organoleptic values that represent a return of about a year .